“I may have found a solution to the Wife Problem” is a pretty damn effective way to start your novel. If the book had a different cover – say black and grimy with sinister-looking type – you could be forgiven for wondering if the said solution involved some foul play; but because my edition was bright and perky with a cute font it could only mean romance. Our narrator with the Wife Problem is Don Tillman, professor of genetics in his late thirties who is quickly revealed to be somewhere on the autistic scale. Don is intensely logical and literal, and has a highly regimented lifestyle concentrated on the ultimate efficiency in everything. He sees emotion as inconvenient, social norms tend to baffle and exasperate him, and success in romantic relationships has unsurprisingly proven to be elusive. So one day Don decides to approach the wife problem with a purely rational method, by compiling a detailed questionnaire that will automatically weed out unpromising candidates right from the get go. This, Don reckons, will help him find his perfect mate and prevent him from wasting time with unsuitable women. Then he meets Rosie – vegetarian, smoker, drinker, unpunctual, working as a barmaid – who fails on pretty much every score. Yet he strangely enjoys her company and soon gets sidetracked by The Father Project when Rosie enlists his skills to help her find her biological father. Is Don going to realise that Rosie, despite her “deficiencies”, is The One for him? Is the Pope Catholic? Until roughly half-way, I thought the book was as charming and delightful as a fluffy puppy with a shoe in its mouth. The light, breezy, warm-hearted tone is pitch-perfect, and Don is a likeable, endearing protagonist with a unique perspective on the world and human relationships. I don’t know how realistic this portrayal of someone with Asperger’s is and it could well be exaggerated in places for comic effect, but it’s entertaining for sure. Unfortunately, a novel that’s over 300 pages needs a decent story to sustain it, and this is where I felt the book fell short. The mystery of Rosie’s parentage just wasn’t all that interesting and I got bored with Don and Rosie’s global hunt for DNA samples from the potential fathers, which takes up a big chunk of the plot. Another major problem is that Rosie herself is a pretty flat character who I never got a true feel for, despite the author’s attempts to make her edgy with occasional expletives and feminist statements. It’s a bit of a problem when Don’s earlier social mishaps and dating disasters are heaps more fun to read about than his relationship with Rosie that you’re supposed to care about. There’s one section set in New York which is pure rom-com cliché – I wasn’t surprised to learn that this book was originally intended as a screenplay, because it seemed like such a deliberately visual montage of typical things soon-to-be-in-love couple does in a romantic setting. 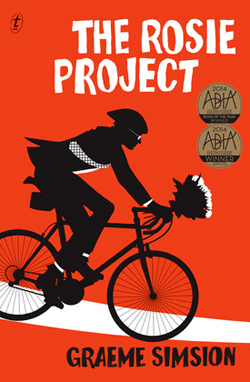 It doesn’t lose its charm completely, but for something that started out so fresh and promising it was a shame to see The Rosie Project fizzle out.